In the early eighties, when I applied, the buzzword for college acceptance was “well-rounded,” which referred to a student who participated in many different activities. That is no longer what colleges are looking for. Now, they want to build a well-rounded class made up of students who will each fill one or two slices of their total round pie: In other words, students who are unique, focused, and angular (or express excellence or uniqueness) in their interests. Peter Johnson, The Director of Admission at Columbia University, echoed this view when I heard him speak recently. Johnson said that Columbia is seeing a rise in what he calls “Niche Applicants” and what I call Angular Applicants. These are students who have already demonstrated a deep independent intellectual curiosity or expertise in a given area from science research to humanities to outstanding athletics. An angular student can also be a student who has developed a degree of excellence in one or two areas—leadership, intellectual curiosity, athletics, or community service—or who has a special talent or exhibits unusual personal character. 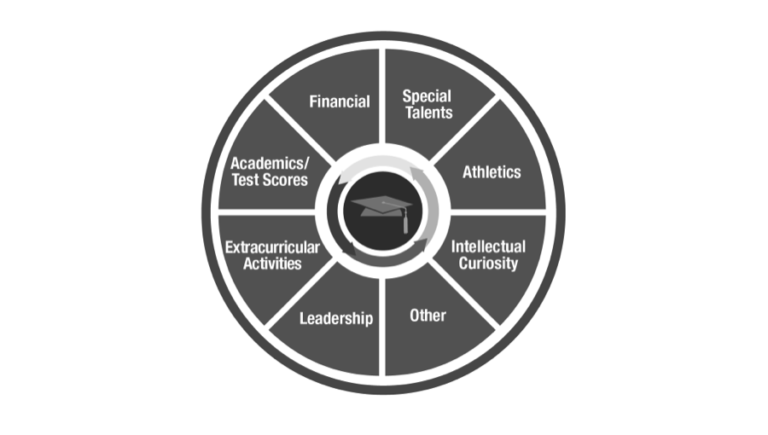 I developed The College Application Wheel™ to serve as a framework and tool to assist parents and students in identifying a student’s strengths and “gaps”—areas that students may need to fill in such as community service or higher standardized test scores—it will also help determine where energy should best be spent in making a student shine or stand out from the crowd. It will help students understand what makes them unique, how to find a college that values them for who they are, and help them see where there is a match between the student and a specific college. Colleges don’t expect students to excel in all eight of these categories, but they do look at these areas to determine if a student will be a good academic, cultural, emotional, financial, and character-based “fit” with their institution. Colleges want to build a well-rounded class made up of students who will each fill one or two slices of their total pie: in other words, students who are unique, focused and angular in their interest – “Such students are known in college admissions circles as ‘pointy’ – being well-rounded doesn’t cut it anymore. You need to have a spike in your achievement chart,” according to a 2011 New York Times article. While academics and test scores get students into the college admissions game, they are no longer enough to ensure a student will be a successful player. The traits that can be identified within The College Application Wheel™ can tip the scales in a student’s favor. Colleges want to create a community of learners and assemble a group of students who will collectively make up a well-rounded class. Knowing what pieces of the college’s wheel a student fills out and what their angle is will help a student find the right fit between them and a college. So how do you decide which pieces of the wheel apply to your student? Each of the eight parts of the wheel deserves attention, because taken together; they will help your student understand where to focus their energy. For instance, if your student is not athletic, that segment of the wheel will not apply to them and that is okay. However, the wheel has two parts. The first part is to understand which segments are their strengths and the second part is to know how to link these assets to the needs of the college. In other words, you want to help the college your student chooses see how they will positively contribute to its campus life given your student’s strengths according to the wheel. Going one step further, it is only through a thorough examination of your student’s alignment with the wheel and the college’s alignment with the wheel that you will be able to help your student select the right college for them. Seeing the success of using this approach over the past decade in my private counseling practice, made me want to make these tools I had developed, accessible to more students than the ones I work with one-on-one. My book, Surviving The College Application Process, will walk you through the process of developing a strategic plan for high school and applying to college. The book reviews case studies of eight real students who used this approach to develop their own plans and successfully apply to colleges that valued their strengths. One such student, Kyle, was an athlete turned actor, who lacked confidence to accept a position on the varsity soccer team during his sophomore year. He remained on the junior varsity team, and missed out as the varsity team won the state tournament that year. He used his regret to fuel his newly developed special talent for acting. Whereas he let his fears control him in soccer, in acting, he was determined to push through his fears and take risks. He had above-average grades, but his SAT scores did not match his grades. He realized he needed to push himself academically and needed a more rigorous curriculum. Kyle also needed financial assistance, which was factored into his overall strategy. Ultimately, Kyle was accepted to multiple schools with merit aid. The above is one example of the case studies in this book that describes students with varied background, interest, and aspirations. So what’s your student’s angle? By Lisa Bleich, President and Founder of College Bound Mentor. Lisa Bleich is founder and president of College Bound Mentor, LLC and the author of Surviving the College Application Process: Case Studies to Help You Find Your Unique Angle for Success. She mentors students from all over the world on the college application process, helping them uncover their strengths and develop a personal plan for success. Lisa holds a BA in European cultural studies and French from Brandeis University and an MBA from Harvard Business School. She lives in New Jersey with her husband and three daughters. Two of them have successfully survived the college application process! Interested in more information about the college admissions process from Lisa Bleich, then check out her book Surviving The College Application Process. Newer PostShould You Hire A Private College Counselor?